Wow, you guys love babies! We so appreciate all your congratulations — it’s remarkable to think that Minnow already has well-wishers from Australia to the Netherlands. Makes me feel all warm and fuzzy, y’all. The queue of woolen garments to make for my little one wraps around the block, as you can imagine. But if all goes well, I’ll be bringing him or her home in the early or middle part of August. Just for fun, I looked up some recent August temperatures for Portland. Last year it was 95 degrees on 1 August. The year before that we hit 96 on 5 August. The 11th itself hasn’t been too bad recently: 82 degrees at most, so if the kid comes right on time we should be okay. But the 15th two years ago reached 100 degrees. In sum, wool probably won’t be the fiber of choice for a coming home outfit. 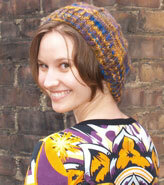 So in an atypical move, I purchased some cotton-blend yarn: Kollage Luscious. I’m going to cast on Brandy Fortune’s Milk Infant Top and make some matching stripey pants or longies (we’ll see how the yarn holds out… it was on clearance so I won’t be getting more). I love the white and green of the original, but I only had two colors to choose from — luckily they go together and remind me of cinnamon toast. By rights I should be getting loads of knitting time during the many, many Holy Week services we have to sing, but alas, I’ve been moved back to the front row in full view of the congregation so I’m not allowed. Tonight alone I could have knit through three baptisms as well as the lengthy sermon. Well, maybe not the baptisms… we were still holding lit candles at that point. Turning the pages of my music without setting fire to them, the sleeves of my robe, or another soprano’s hair is challenging enough; knitting while holding a candle might really go beyond what’s possible. Instead I’ve had to amuse myself by choosing names for my child among the composers in the hymnal. How does Horatius Bonar strike you for a boy? No? Anyway, now to bed. The first call for the choir tomorrow morning is at 7:30, and I might need to make another attempt at cinnamon toast beforehand so I can stay upright. Happy Easter if you celebrate it. P.S. I think Minnow may be developing a fondness for the communion sherry during all these extra services. You must try Sin Dawg by Dave’s Killer Bread! It is so good. But addictive! I love the Milk Infant Top and may have to get the pattern for our little one. Yes, cinnamon toast is with cinnamon sugar!Happy Easter! How lovely to sing in the choir. Happy Easter to you, too. The Milk Infant Top is adorable. somehow i missed this announcement – congrats! we always made cinnamon toast with a mix of cinnamon and brown sugar – yum, you’re making me crave it and i’m not supposed to have any sugar right now. oh well, happy easter! Hint: pre-mixing the sugar and cinnamon makes it especially pleasing. I haven’t made cinnamon toast in a while but put sugar & cinnamon on extra pie crust last night and wished I’d taken the time to pre-mix. Heights of hilarity and intellect over here. Baby-brains, I guess. Happy Easter! You know we’re not religious, but I think I get the concept of focusing one’s mind in that way, and I admire that you spend so much time doing so. I’m a bit too lazy for true devotion. Wow, 7:30 — I was complaining because my husband had to be at choir this morning at 8. We had to fit the whole basket / egg hunt / video-ing the kids before he left, and he didn’t come back until 1. But 7:30 would have been way worse for sure. We’re white sugar/cinnamon on whole wheat toast people ourselves. Adorable sweater. My favorite for my baby was a raglan pullover by debbie bliss actually. It has this wide open, square sort of neck that’s easy to get on and very cute. She wore it for ages. 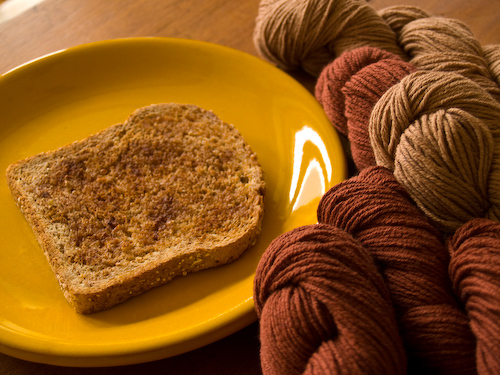 Mmm… cinnamon toast and brown yarns. Good combo! In the toast department, I have to say that lots of butter is a must, and although I’ve lost my taste for Wonder, I still mix the cinnamon with sugar. Cinnammon toast — yum! Hope you and Mr. G had a very happy Easter! Congratulations! I have a niece due in June and all I’m knitting is cotton, cotton and more cotton. Eventually I’ll make larger sized things in wool but I’m afraid to touch it just yet. My husband made cinnamon toast for me when I was feeling blue one day and I looked at him and asked him what he had done. Yup, no sugar, just cinnamon. I then directed him to the tiny tupperware I have with cinnamon and sugar mixed for those two or three times a year I really want my bread covered with delicious sweetness. That’s going to be cute as can be! I’m not a huge fan of knitting with non-wool, either, but sometimes it’s really the best option. I do like Mission Falls 1824 cotton, esp. in garter stitch! Mmmm… cinnamon toast. You definitely need sugar along with the cinnamon to get the full effect. It depends on if you are going for the sound of the name or the content of the life. If judging by content Horatious Bonar is EXCELLENT! God bless you. Hope all goes well for you all!